This is my friend, Chuck Williams, favorite salad! Wash and dry the lettuce. Section the grapefruits, reserving the juice for the dressing. Peel and slice the avocados. Combine the vinegar, olive oil, and the grapefruit juice. Season to taste with the salt and pepper. Toss the lettuce with enough dressing to coat the leaves. Arrange the lettuce on individual plates. 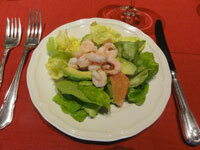 Arrange slices of grapefruit and avocados in a pattern like a flower in the center of the lettuce. Place a mound of shrimp in the center of the grapefruit. Spoon over additional dressing. Copyright © Mary S. RisleyServes 6 to 8.